Solo, Chamber & Orchestra bassist, Collegiate Professor, Private Teacher, Music Editor, Arranger, Jazz Bassist, Jazz Guitarist, Music Manager & Contractor. August 14, 1941, Edmonton, Alberta, Canada. 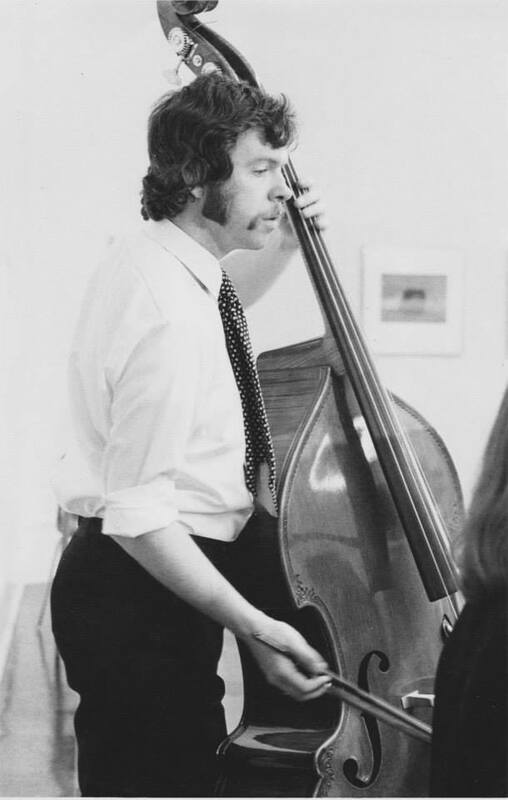 George Woodall at University of Alberta, 1962-1965 (the first graduated bass student of the school), Bachelor of Music Honors, 1965. Canada Council award to study with Frederick Zimmermann, in addition to Prof. Zimmermann’s own personal scholarship for a year of study. 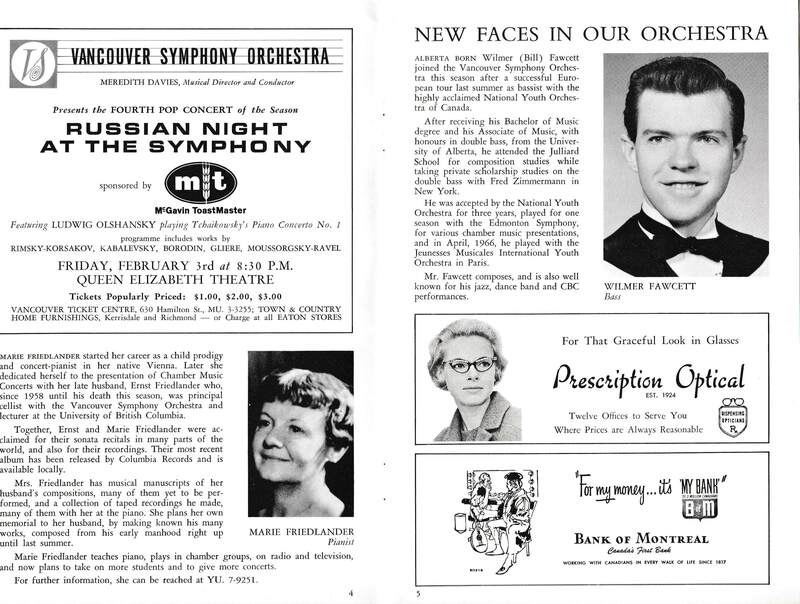 Baroque Strings of Vancouver – c.1967-c.1980. Edmonton Symphony Orchestra, 1964-65, Section. * CBC Radio Orchestra has changed name three times, thus it may also be known as CBC Vancouver Chamber Orchestra or CBC Vancouver Orchestra. National Youth Orchestra of Canada, 1964-65.
International Youth Orchestra of Jeunesses Musicales in Paris, 1966. National Youth Orchestra of Canada, 1966. 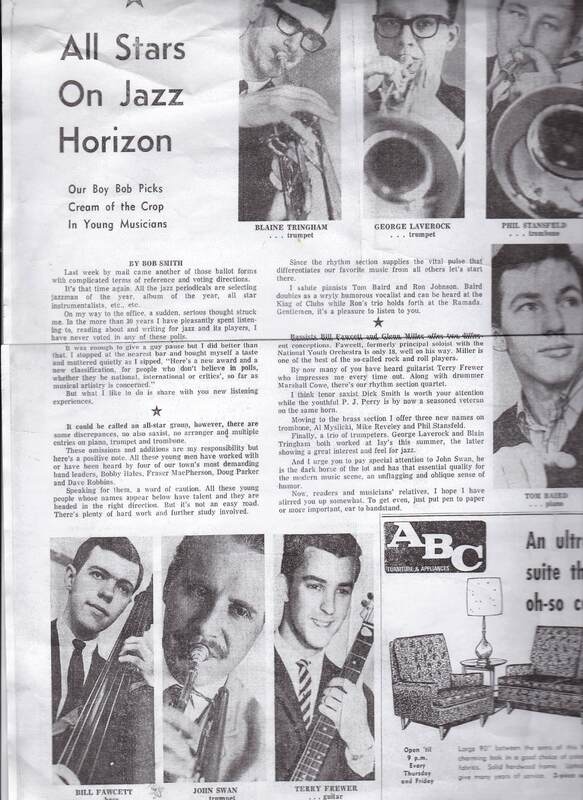 The Black Spot, Vancouver, c1960-61, guitar. The Yardbird Suite, Edmonton AB, 1962-65, bass. The Ron Johnston Trio, Edmonton, 1962-65, bass. Many other casual engagements in Edmonton and Vancouver, bass. Viveza (Salon Music Ensemble), Vancouver, 1988-present, Double Bass, Founding Member. Vancouver Community Music School (changed to Academy of Music), 1978-79, Instructor. Douglas College, Greater Vancouver Area, 1978-79, Instructor. University of British Columbia, Vancouver, 1978-79, Instructor. 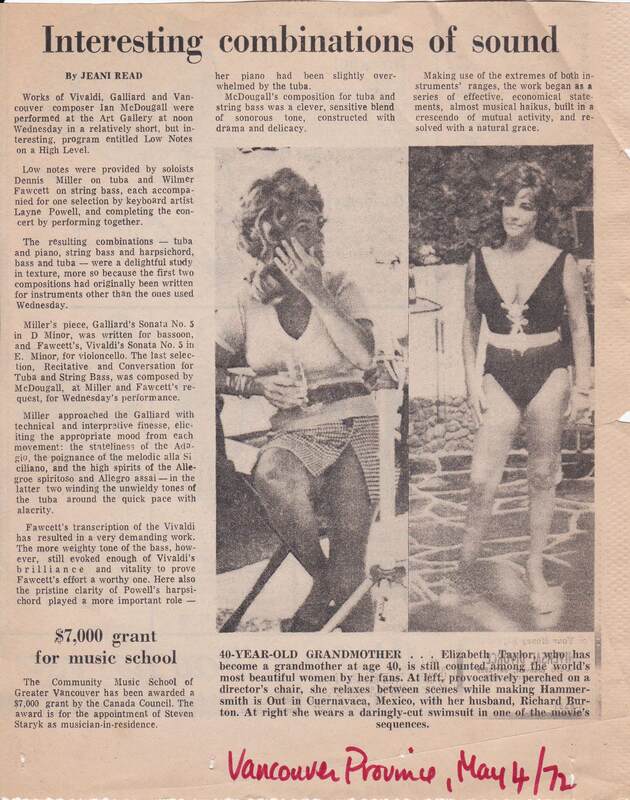 Private teacher, Vancouver area, 1968-69. Conversations for Tuba and Bass were commissioned by Wilmer Fawcett bass and Denis Miller tuba. 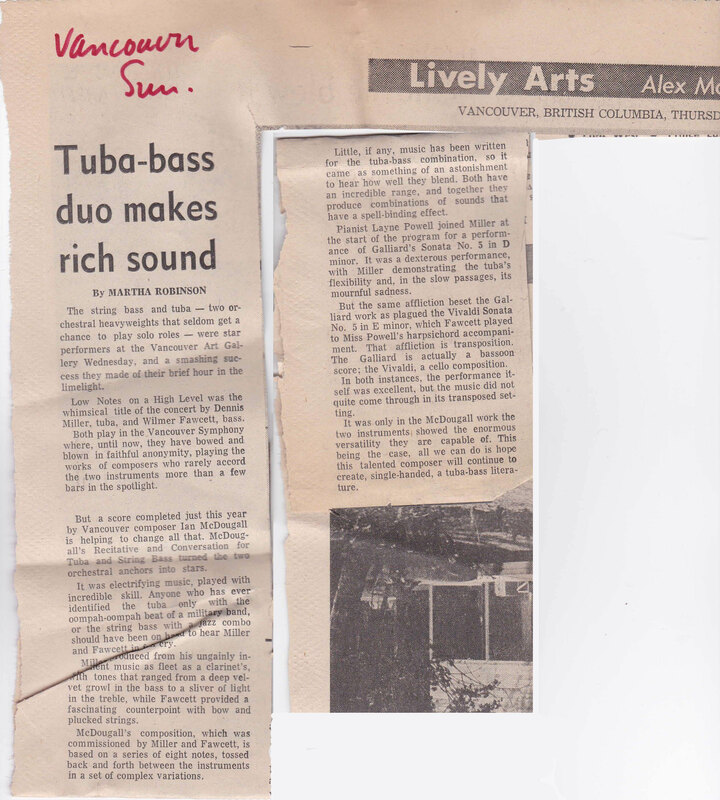 The premiere took place during the May 3, 1972 concert, titled “Low Notes on a High Level,” at the Art Gallery, Vancouver. The following two reviews corroborate this unique event. Dittersdorf, Karl Ditters von. Sinfonia a Contrabasso e Viola Concertanti. 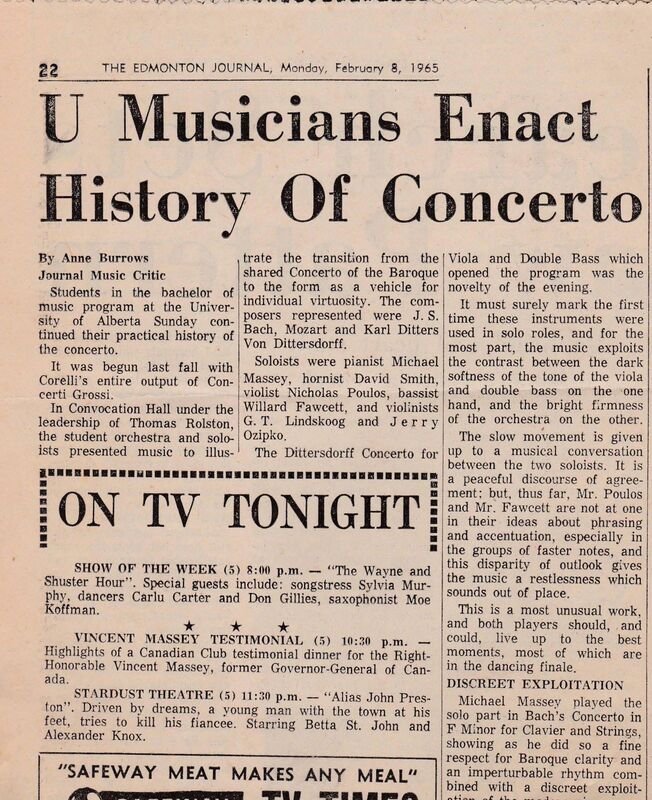 University of Alberta Symphony Orchestra Concert, 1965. Performed on February 8, 1965. University of Alberta, Edmonton, Canada. Wilmer Fawcett was in his senior year at the University of Alberta at the time of this concert. Viola part performed by Nick Pulos. Eccles, Henry. Sonata in G Minor. Baroque Strings of Vancouver, leader Norman Nelson, arranged for string orchestra by Wilmer Fawcett. Kohaut, Karl (1726-1784) – Concerto per il Contrabasso. CBC Vancouver Orchestra Broadcast Recording, 1982. 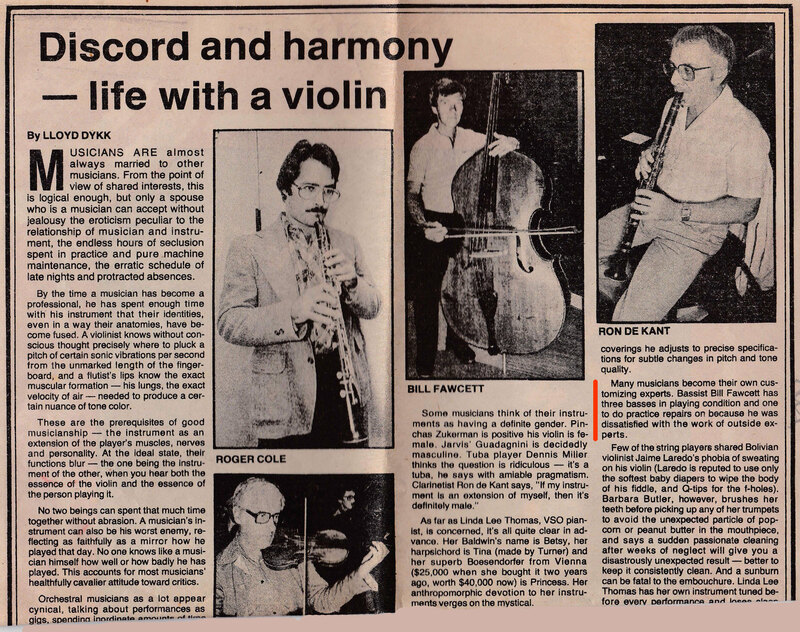 Broadcasted on November 18, 1983 ; CBC FM band ; CBC Vancouver Orchestra ; soloist Wilmer Fawcett on bass in Viennese Tuning ; orchestra leader Elizabeth Wilcock, as a concertmaster. Recorded: December 11 and 12, 1982 : 10.30-1.30, CBC Studio 1, Vancouver, Canada. 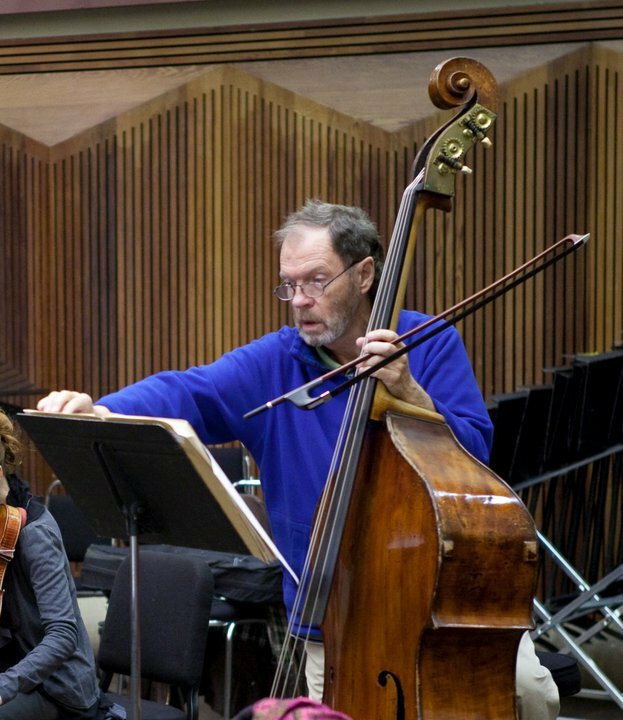 This broadcast has featured the first modern performance of Kohaut’s bass concerto in Canada. It was organized through the initiative of bassist Wilmer Fawcett, who also edited the concerto from the original parts for the ensemble. This broadcasts has also featured for the first time an authentic solo bass performance on a period Viennese tuning. The following audio files are presented by courtesy of Wilmer Fawcett. Mozart, Wolfgang Amadeus. Per Questa Bella Mano, K.612. 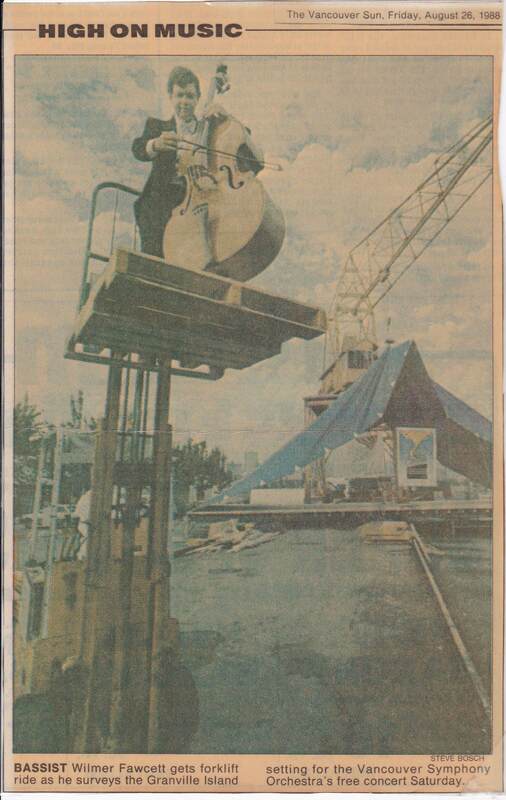 CBC Vancouver Orchestra Concert, 1991. 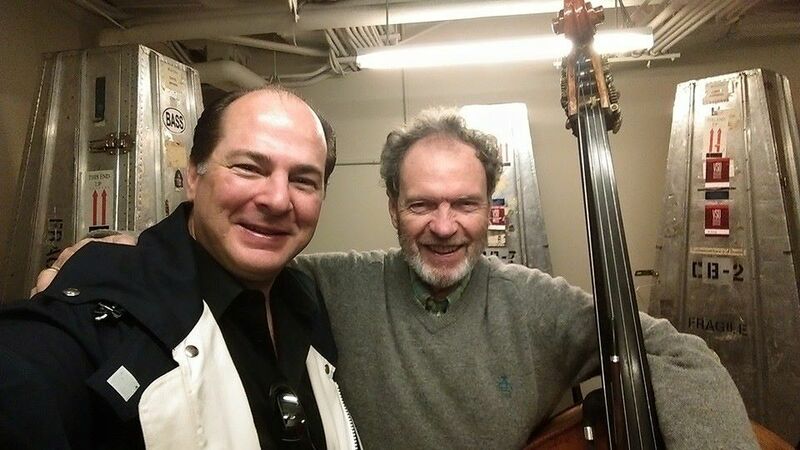 Performed on November 10, 1991, 3:00 pm at Orpheum Theatre, Vancouver, Canada ; CBC Vancouver Orchestra ; Soloist Gary Relyea as bass voice, Soloist Wilmer Fawcett on bass in Viennese Tuning ; Conductor Bruce Pullan. The performance of this aria was due to coincidence of Mr. Fawcett hearing CBC producer Karen Wilson express a wish “if there was another work in which she could showcase Gary Relyea?” To which Mr. Fawcett was quick to suggest Mozart’s Aria, where he would be a soloist as well. Thus on a short deadline this piece was quickly prepared. 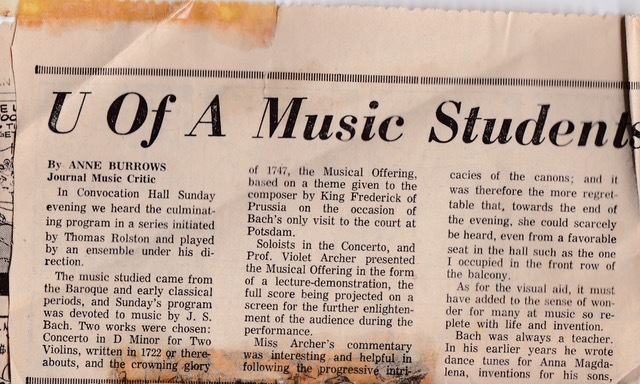 Also, considering that the bass was set in the original Viennese Tuning, this was likely the first authentic performance of Per Questa Aria in Canada. The following audio file of this concert was presented by courtesy of Wilmer Fawcett. Davies, Peter Maxwell. Strathclyde Concerto #7, CBC Radio Orchestra, Studio Broadcast Recording. Broadcasted in 1995. 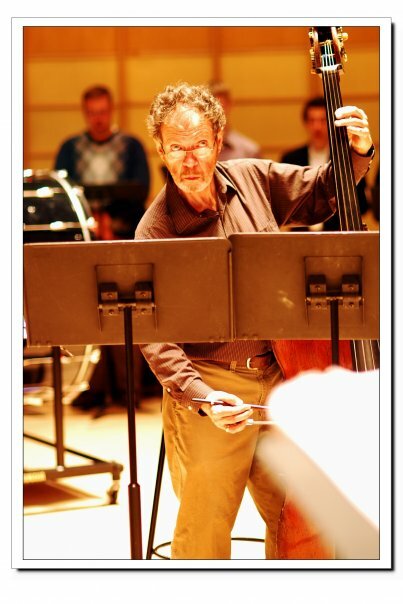 Wilmer Fawcett, double bass solo; Peter Maxwell Davies conductor. Canadian premiere. Recorded on June 1 and 2, 1995. Vancouver. Bass Setup: Orchestra Tuning, Corelli strings. 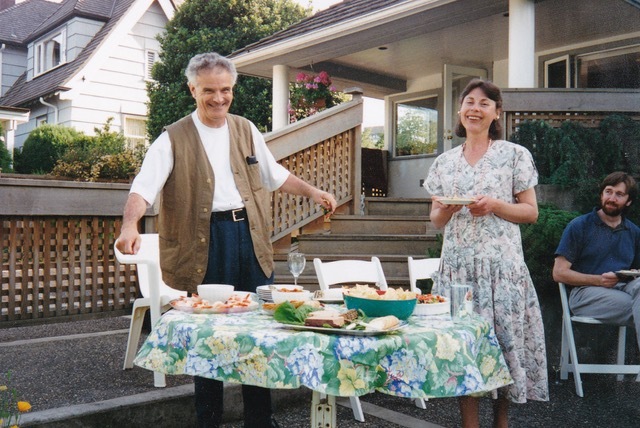 During the early nineties composer Peter Maxwell Davies was working closely with CBC Radio Orchestra. An opportunity to record this concerto came through the maestro Davies’ wish to record this concerto with CBC Orchestra as well. Thus a CBC producer Karen Wilson related this to Wilmer Fawcett, who in turn simply could not miss on the offer. The solo part of this concerto demands sophisticated harmonics technique in the higher register, which Fawcett skillfully arranged for the lower positions’ equivalents for the sake of convenience (high shoulders of his Lott instrument). 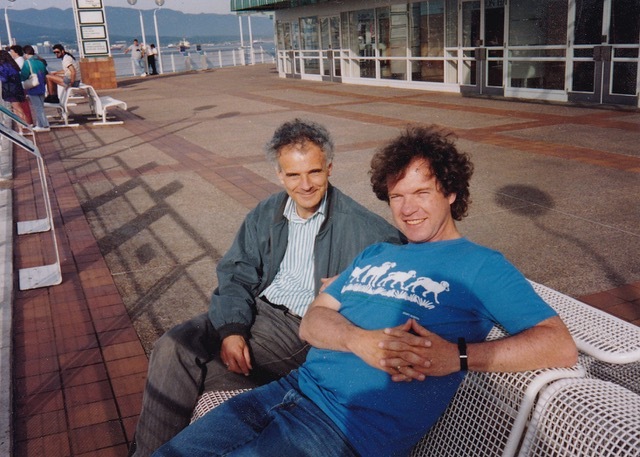 Image 1 – P. M. Davies and W. Fawcett – shared moment at the Canada Place (cruise ship terminal). Image 2 – P. M. Davies and W. Fawcett at the post recording reception. Image 3 – Post recording reception with P. M. Davies, Mrs. Fawcett and recording engineer Don Harder (seated). Stravinsky, Igor. Pulcinella Suite, CBC Radio Orchestra, 1992. CD Recording. Performed on March 6-7, 1992, The Orpheum, Vancouver ; Recorded in CBC studio 1, Vancouver ; Mario Bernardi, conductor. Wilmer Fawcett, solo bass. Click on the link, follow to the lower right “Free Preview”, click it and the preview page will open. Chan, Ka Nin. The Salmon Quintet. 1992. Wilmer Fawcett solo in Stravinsky’s Pulcinella Suite, “Vivo” movement. CBC Vancouver Orchestra. Mario Bernardi, conductor. Recorded March 6-7, 1992, The Orpheum Theatre, Vancouver, Canada. Wilmer Fawcett principal bass. Recorded at the Orpheum Theatre, Vancouver, BC, July 2-3, 2002. Click on the link, scroll down to “Free Preview” tab at the lower right, click it, the recording preview page will open. No. 7, Weisgarber, Elliot. Night. Vancouver Chamber Choir ; Jon Washburn, conductor ; Bruce Pullan, baritone ; Wilmer Fawcett, double bass ; Purcell String Quartet. Live performances from the Orcas Island Chamber Music Festival. OICMF Chamber Orchestra. Schubert, Franz. Quintet for Piano, Violin, Viola, Cello, and Bass, Op. 114 “Trout”. Vancouver Chamber Choir ; Jon Washburn, conductor ; with Cris Inguanti, clarinet ; Cameron Wilson, violin ; Wilmer Fawcett, double bass ; Graham Boyle, percussion ; Linda Lee Thomas, piano ; Bryn Nixon, organ. Recorded Oct. 24-25 and 30-31, 2007, Ryerson United Church, Vancouver, BC. Gwen Thompson, violin ; Mark Koenig, violin, mélodica ; Lee Duckles, violoncello ; Wilmer Fawcett, double bass ; Linda Lee Thomas, piano ; Salvador Ferreras, percussions. Gwen Thompson, violin ; Mark Koenig, violin, melodion ; Lee Duckles, cello ; Wilmer Fawcett, double bass ; Linda Lee Thomas, piano with Salvador Ferreras, percussion. Gwen Thompson, violin; Mark Koening, violin and melodion; Wilmer Fawcett, double bass; Linda Lee Thomas piano; with Salvador Ferreras, percussion. Recorded live at Vancouver Studios, June 9-12, 1992. Gwen Thompson, violin; Mark Koening, violin and melodion; Wilmer Fawcett, double bass; Robert Holiston, piano; with guest artists. Gwen Thompson, violin ; Mark Koenig, violin, melodeon, viola ; Wilmer Fawcett, double bass ; Robert Holliston, piano ; Salvador Ferreras, percussion. Recorded April 6, 8, and 9, 1998, Western Front, Vancouver, B.C. Program notes in English by Wilmer Fawcett (1 folded sheet : port.) inserted in container. Originally issued in 1998 by Omega Records. Gwen Thompson, violin ; Mark Koenig, violin, melodeon ; Wilmer Fawcett, double bass ; Robert Holliston, piano ; with Salvador Ferreras, percussion ; and Rosemarie Landry, soprano (track 8). Mirecourt bass labelled Vuillaume, 1844. 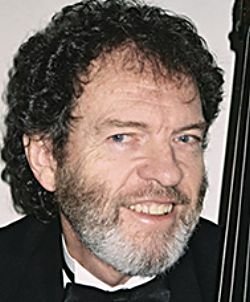 Jazz Bass and Guitar, Reading, Genealogy, Gardening. Ruth New, noted Edmonton soprano (died 2017) who encouraged Wilmer Fawcett in his study of music while at Edmonton. Wife Lucy and son Anthony who helped and encouraged Wilmer in his many musical projects. Note: Anne Burrows, the music critic for The Edmonton Journal was actually blind, thus a remark on Wilmer Fawcett’s playing is even more fascinating. Dittersdorf, Concerto No. 2, Cadenza, Manuscript. Kohaut, Karl. Concerto per il Contrabasso. Score and Parts in Manuscript. 1982. Prepared for the 1982 CBC Vancouver Orchestra recording sessions. For performance details see Solos heading above. 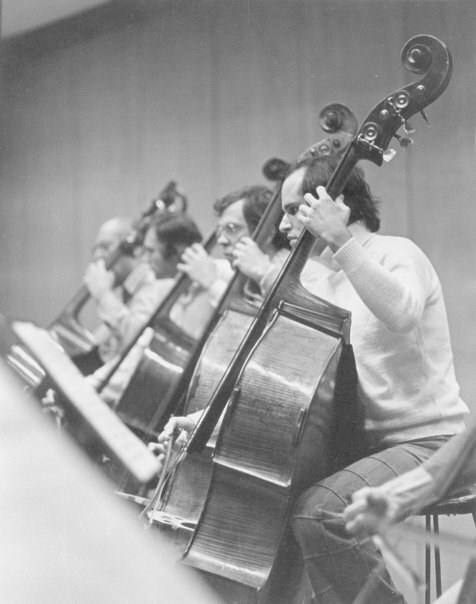 Gavin Bryars, Kenneth Friedman, Murray Grodner, Rudolf Malaric, George Woodall, Frederick Zimmermann. 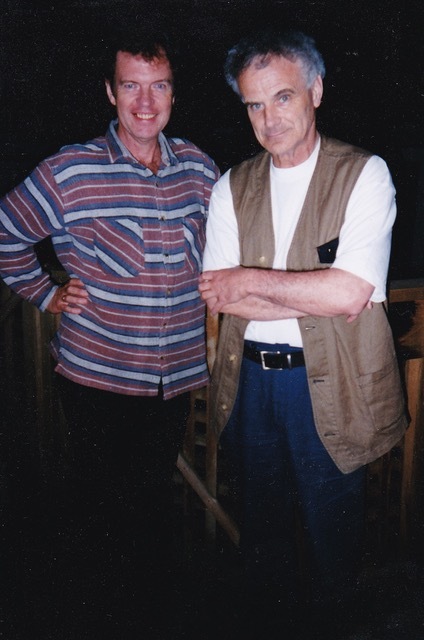 Sir Peter Maxwell Davies, Ian McDougall. Kazuoshi Akiyama, John Avison, Mario Bernardi, Meredith Davies, John Eliot Gardiner, Bramwell Tovey, Yannick Nezet-Seguin.